Where to Buy Wedding Lehengas for Brides in Delhi! Well, Delhi is flooded with brides-to-be to shop for their wedding lehenge. 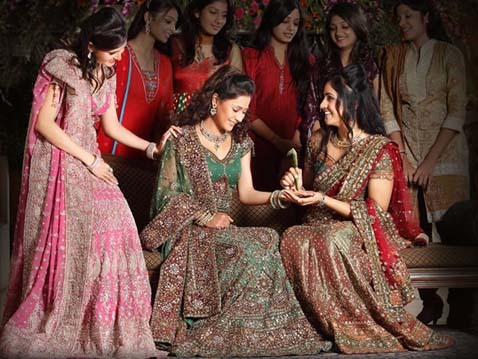 There are tons of places in Delhi that sells Wedding Lehengas at the most appropriate prices. Again, if you are an NRI, and would like to purchase something from Delhi, I would suggest you to get something custom made from India. However, below is the list of some of the best shops displaying the most beautiful Wedding Lehengas for all the brides-to-be in India. Frontier Raas(Sale is on August- September) : This is the most sought place for Bridal lehenga in Delhi. The range starts from 20K and goes up to about 4 L. They have styles of gota-patti work ,kundan work, sequin work and the styles emulate a lot of Sabyasachi , Manish Malhotra & Anamika Khanna. They tend to show you the good stuff if you can prove that you are serious otherwise it will be only waste of time as they show mediocre things initially. Chandni Chowk: As soon as you get off the Chandni Chowk metro station and you will be attacked by ‘Lehenga Agents’ who will take you to their favorite shop for their part of commission. You will find lehengas for as little as 10K, some gorgeous options at 50K and even go upto 5L. Of the lot the most famous of all is the ‘Om Prakash Jawahar Lal’. They have the most wonderful collection, especially if you have a fetish for swarovski work. You may not get a 24 kali lehenga but maybe a 14-18 kali lehenga. Other shops in Chandni Chowk show you panels and for you to mix and match, all you need is a little. Designers: If you can afford a heavy budget on your bridal lehenga, say at least 2.5 L, I would suggest you to head to Emporio Mall in Vasant Kunj. It has all designer work such as Suneet Varma, Pallavi Jaikishan, Anamika Khanna, Sabyasachi, Tarun Tahiliani and Varun Bahl under one roof. Even if you can’t afford this stuff, still go and check it out because you get a ton of ideas for what kind of lehenga might work on you. Bridal Asia, Vivaha and Jalsa Exhibitions: If you want a stylized, customized option but at the same time do not want to spend much, approach time independent designers. They are a lot cheaper than the big brands and you can also customize according to your own style. What-so-ever, they rarely sell lehengas for less than 80K and mostly hover around the 1 to 1.5 L mark. These designers usually display in exhibitions and they are worth attending. There are a ton of small time designers in Delhi who will not only help you with your bridal lehenga, but also for your engagement options, trousseau outfits etc. CTC Motinagar: The lehenga in CTC Motinagar ranges from 30 K to 5 L. They also provide a lot of customization option to help you create your own lehenga. Their designer is quite creative. Hoiwever, you won’t find too many great options at less than 80K but in the >80K segment there are a bulk of amazing options for you to explore. Ushnaq Mal: Ushnaq Mal is one of the oldest shops in Delhi that is still at its bloom. You may not like all of the options few of them a few are truly worth taking a look. You are also allowed to mix and match. Moreover, they are relatively reasonable and cheap compared to frontier and the likes. Hauz khaz village: The Hauz khaz village is a must visit if you are in Delhi. It is the most preferred option if you wan an ultra stylish lehenga. The prices are not cheap; however, the designs are definitely worth a look. Visit during Sale time for best Bargain: Remember that even shops like Frontier give discount. All you need is to know the art of asking. Shop dual dupatta’s: Every bride needs two dupattas; one on the head and one separately round the waist and over the shoulder. The lighter net dupatta is usually put on the head and the heavier one in the usual drape. Do not skip the Waist belt: Lehengas look very beautiful with waist belts. They add that Indian princess look, and make you stand out from the crowd. Get flare lehengas for your wedding day and store the fish kali and slim silhouettes for engagement/ reception: Indian brides usually look full and flared, traditional and classic. The modern silhouettes should be left to the other functions. Don’t go with a closed mind about colors: Be flexible on the color when you go shopping. For example, if you are determined to NOT buy a red lehenga, I am afraid you might end up buying a red one only. Don’t judge shops by the products on their website: Do not every judge shops by the products displayed on their website: Shop being an online freak and step in the real world. It is a complete topsy-turvy ride. Do not exceed your budget: If your budget is 1L stick to that. Once you start seeing some of the 2L ones, I know you won’t feel like coming back to the 1L ones. Therefore, see only your budget, because the expensive ones start tempting you all the more.